As the competition grows, need to have a job also grows and sometimes it tempts you to go to company directly and drop your resume to make sure they have your resume, but is it a proper way to apply for the job? Or is there any other way you can apply for the job like online? There are so many questions about how to properly apply for a job in person. Everyone wants the job and to get the job, you have to start applying but with the right method. Is it Better to Apply for a Job in Person or Online? Applicants may wonder many times, is it better to apply for job in person or online? And sometimes without proper knowledge chances of getting job becomes nil. So to apply for a job check first what company wants? Check the advertisement carefully and read all the information or you can check company website under career column. Most of the companies specify clearly what they are looking for and by reading Ad carefully you can decide if you should apply in person or online. To apply online go through company website or the job portal and apply there directly. So the question is how to properly apply for a job in person? Going In Person to Apply for a Job? A person needs to decide first that is it okay to apply in person and to decide you have to check few details because as we enter in the world of globalization most of the tasks are done through mail or company website. There are possibilities that company do not want offline application and by applying in person, you will jeopardize any chance of getting job so checking first that what company wants is necessary. Check job websites or company website and read all the terms and condition carefully and check the criteria of applying for the job. Sometime it happens that local businesses, stores, shops, retailers and other small enterprises post a sign outside of their property or on the main gates when they have vacancies for the job. If there is a sign outside then you can go inside and inquire about the job and hiring process with other details like pay and working hours. a) It is necessary to look presentable enough to check inside and if you are not wearing proper dress, shoes and combed hair with clean appearance then avoid going. First appear presentable then go and inquire about the job. b) You don’t need to be dressed in formal business attire but a proper dress is must to receive application for the job. By applying for the job you do not have authority to pester Hr manager. Do not go unannounced it may look bad on your resume or you may go noticed for totally wrong reason. It often happens when candidate apply for the job in person and go unannounced to know about the application. It may look like you are giving good impression but in reality it may show you like some desperate candidate or lack of patience who can’t follow simple rules. It can cause you to lose the chance of job. How to Apply for a Job in Person? 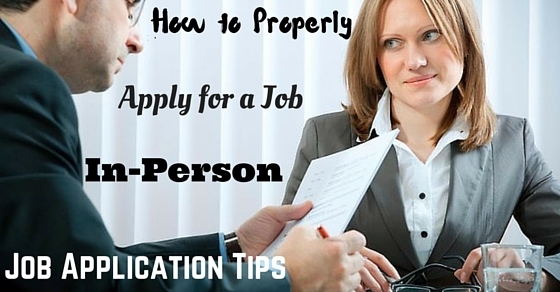 There are some rules and regulation followed when you apply for job in person. These rules help you in submitting your application without hitch. The common process for applying in person is. Resume is an important document you need when you apply for the job. It is the first document you submit when you apply for the job. This is the document that contains all the information about you and provides necessary details to the company when you apply for the job. When you prepare your resume keep in mind that it has all the necessary details without any mistakes or false information in order to be considered for the job you are applying for. Attach a cover letter with your resume which describes your interest in job and how qualified you are for the job. Your cover letter is the page that describes you and your interest in the job you are applying for and why you are qualified for this job. Cover letter helps you in specifying what you want and how you deserve it. Cover letter is a one page document but plays important role in selecting your resume for the job. Your cover letter should be neatly organized. Do not make your cover letter lengthy or crowded with all information just describe everything in 3 paragraphs. At the end of your cover letter, thank the reader for their time. Additional document you can bring with you when applying for the job, the letter of recommendation and any other document relevant to your work or reference. These additional document can increase the chances of selection. Bring a folder to keep your portfolio in arranged order and avoid any wrinkle caused by your travel. Always dress properly and carefully as your appearance is your first impression. It is necessary to dress appropriately as it shows how interested and dedicated you are for the job and work. Poor dressing, wrinkle clothes, unfit dress, unmatched shoes and bad hair can ruin your whole appearance so dress smartly when you go to apply for job in person. The way you talk and respond affects your chances of getting job so when you go for job application submission, use polite and firm tone. Be respectful and don’t show aggressiveness or nervousness through your gestures and state clearly that you want to apply for the job that’s why you are here. Way of speaking always affects your appearance. Never use rude behavior or harsh words while applying for the job. Avoid showcasing yourself as it may look bad on your resume. Generally, candidates think that by showcasing unnecessary details you can impress your potential workplace or the people who work there and it will increase your chance of getting job but it is completely wrong and it will give a total wrong impression. When you apply for job in person keep these points in mind and prepare well because good preparation in advance comes handy when you apply for the job in person. These are the basic qualities you will need at every step of your career whether you are a fresher or an experienced employee. What to Wear When Applying for a Job in Person? Your first look and appearance is your first impression to your potential work place or potential boss and dressing poorly can damage your image and ruin your chances of getting job. What to wear when apply for a job in person is great concern for the candidates who apply for job in person because poor dressing can work in their disadvantage. Dressing according to need and requirement can give a positive impression to your application but the question is how to dress or what to wear when applying for the job in person? Business casual is the right attire to wear when applying for the job in person. It makes you look professional enough and broaden the chances of resume selection. Wearing right cloth is important and business casual combines everything you need in your attire. Full sleeves button down shirt with pant or khaki for men and skirt or trouser with blouse or shirt for women. Do not wear bright colors while carrying business casual as it will make you look like an idiot and chose color and clothing according to the weather as jacket in summer and simple shirt in winter looks like a joker. Blue, khaki, white, black and gray is the appropriate color for business casual as they are some neutral colors that work on both men and women and looks good with all skin type. Wear proper shoes to match with your business casual. Leather and microfiber shoes are the best option to match your business casual. Funky shoes, sports shoes or sandals gives impression like you do not care about dressing protocols and it may look bad on your application so be careful when choosing shoes to match your business casual. For women wear something comfortable and classy as well as something according to your dress. Avoid wearing uncomfortable shoes. Do not carry unnecessary accessories. Business casual do not need so many accessories; classy watch can do and it makes you appear more serious about job and sincere. You can carry a bag with you to keep your document inside but nothing over the top or extravagant. While dressing, do not try too much as well as never dress poorly because in both cases, the way you dress affects your impression negatively. Applying for a Job in Person, What to Say? When you apply for job in person it is necessary to use right selection of word, majored tone and the way you speak. They all leave a long lasting impression on your potential company and can increase or decrease your chance of getting job. It is as important as your application to be polite when you applying for the job in person. You can’t be rude or use harsh word for your recipient as it may get you noticed for wrong reason and for a very long time. Ask questions which are necessary or relevant to your job, do not talk back, do not berate or insult any low division worker and use polite gesture with everyone. If there is no opening in the company or organization and you really want to work with the company then you can ask for informational interview. Informational interview gives you insight about the job you admire and can help you in learning. Informational interview is just an opportunity to know more about the work you want to do; this is not the actual interview so you have to ask nicely to get informational interview. Nervous talking never looks good in your interview or when you applying for the job in person, so be prepared. It is better to be prepared than sorry because you may never get the same chance again, so prepare well. Generally, it happens when you applying for the job in person and your potential Hr manager asks a question about your application then you start nervously talking or stuttering it make you look unprepared. So rehearse common asking question and practice well in advance. Be confident; it is the first step towards success. Speak with confidence as no one is going to like a nervous and hesitating candidate. A confident candidate has more chance of getting job than someone who has confidence issue. While it is good to have confidence, overconfidence can work against you so keep your confidence level in check when you applying for the job in person. It does not matter how you are applying for the job. The thing that matters the most is to apply through right medium and satisfy company policies. Different organizations have different selection procedure so read Ad carefully and be sure of terms and conditions. Do a little homework before you apply for the job as you may have to answer some question while you apply for the job. Applying online is easier than applying in person as applying in person has more challenges than applying online. But applying in person can get you job faster as you can know firsthand that how many percent chances you have to get selected. So be prepared if you are applying in person and check all necessary details specified by the companies.